In accordance with Act 206 (2018), Section 712-1258, Hawaii Revised Statutes, it is unlawful for any student under the age of twenty-one to purchase or possess any tobacco product or electronic smoking device. An electronic smoking device is defined as any electronic product that can be used to aerosolize and deliver nicotine or other substances to the person inhaling from the device, including but not limited to an electronic cigarette, electronic cigar, electronic cigarillo, or electronic pipe, and any cartridge or other component of the device or related product. 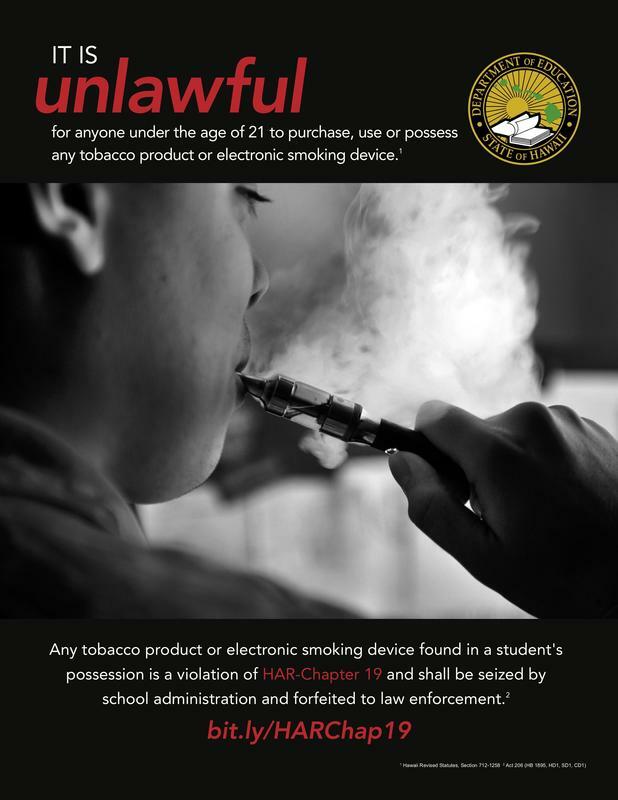 In addition, any tobacco product or electronic smoking device found in a student’s possession is a violation of Hawaii Administrative Rules (HAR) Chapter 19, shall be seized by school administration, and forfeited to law enforcement. This is pursuant of Act 206 (HB 1895, HD1, SD1, CD1), Part II, Section 8(5) effective July 1, 2018. 1. It is unlawful for any student under the age of twenty-one to purchase or possess any tobacco product or electronic smoking device. 2. A student committing this offense is subject to the disciplinary actions of HAR Chapter 19. 3. Electronic smoking devices (e-cigarettes) will be seized, forfeited to the school administrator and destroyed by law enforcement following the conclusion of administrative investigation.